Dell's legacy may be synonymous with traditional computing, but with tablets of particular significance nowadays, it's been dragged into the mix alongside the mobile industry front-runners. Its latest effort -- a tablet that goes by the name XPS 12 (9250) -- throws down the gauntlet to the likes of Microsoft's Surface, featuring, among other treats, a 4K ultra-HD display. The transition to higher-resolution mobile devices remains a work in progress, with 1080p still seen as the de facto standard for a large portion of mobile products. Indeed, while the XPS 12 does have a 4K, Sharp IGZO panel for crystal clarity, Dell is also offering an alternative edition packing a 1920 x 1080 resolution, per info shared by German blog WinFuture. 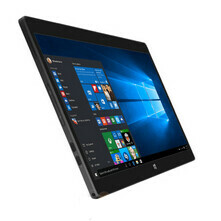 Compatible with the Dell Active pen, the device includes an Intel Core M Skylake processor, Wi-Fi and Bluetooth, and for those seeking more flexible connectivity, an option for 4G LTE. There are two Thunderbolt 3-ready USB Type-C connectors, while storage is provided by means of an M.2 SATA SSD at one of a handful of capacities. There's also an SD card reader for easy expansion and file-swapping, while the cameras consist of 8- and 5-megapixel efforts on the back and front respectively. Build-wise, the slate is comprised of magnesium alloy housing, which should resonate with fans of robust construction and premium finishes. It weighs 790g, and looking at the pictures and specs, the XPS 12 seems a tempting prospect indeed. Those looking for a notebook as well as a tablet will be able to opt for one of the optional keyboards, of which there are two. There's a slick, 1.3 mm-thin keyboard that should cater to the general user seeking the versatility of a hybrid solution. There's also a higher-performing edition that features a full set of backlit keys, a glass trackpad, and a few extra ports including a USB Type-C, two USB 3.0 and an HDMI out. Set for announcement later this month, it'll likely be beaten to the draw by Microsoft and its Surface Pro 4, which should be unveiled at Redmond's confirmed event next week. With Apple having also thrown its hat into the ring with the iPad Pro, those seeking performance tabs will have plenty of decisions to make. Though Microsoft and Apple tend to dominate coverage, the XPS 12 shows that Dell still has plenty to say for itself, and without wishing to tempt fate, this device could cause a bit of a stir. It will certainly kill ipad pro and surface, not surface pro. Idk About That, The Surface Is Just Awesome And The iPad Pro With A9X Will Put A Good Fight. There's Also That New Google Pixel C Its Sure To Be A Great Tablet Being Powered By The Nvidia X1. What what's the point of their soc while they can't even use it what heavy task or games you can do on IOS and Android wtf!? The Google Pixel C might be a fun device, but any sane professional will ignore it. It lacks productivity. Nope none Windows pro ones can do s**t their just a big phone. Dell su@ks big time.. I got their flagship tablet in january. They promised that it would come with loly out of the box.. it did not, they promised again that it would come out in jan, then feb, then march and then april.. finally it comes out on the end of may. Stay away from dell, they dont have enough people in their tablet units to properly keep their tablets up to date. For some reason, that seems to be a common problem with Android OEMs but this is a Windows device. There should be no such issue as the updates are pushed by MS.
An impressive device. I'm loving it. Skylake Core M running 4K, RIP battery life and smooth animations. I have a friend who has a Dell XPS 13 with a 3200x1800 display. It has an i7-5500U, and there are frame drops all over the place. An even higher resolution on a weaker GPU would be awful. You talk the truth. There are very few desktop video cards that are 4k ready. Spec war. And hype. NVIDIA titan/980 AMD 290... They're pretty capable of 4k. And on the mobile front, the Tegra X1. It runs Windows 10 so if it sells well then Microsoft also wins. Looks good if the price is right. But what is this CPU worth and can it support the screen res with reasonable battery life? How much res got iPad Pro? And what is the screen size of this thing? I absolutely hate dell products based on several consecutive bad experiences. The thought of Dell literally makes me cringe inside but maybe they've changed from the mid 2000s. The XPS 13 looks good (still can't bring myself to forget past products to make it my next laptop) However, I'll keep watch regarding the price of this laplet? Or tabtop? Who knows, maybe I'll be interested. The Dell brand may be able to turn it around if they keep releasing the best products. Still though, the name Dell literally makes me feel bad inside given my prior history with them. Very sad. My XPS17 had just turned 4, and my first problem of a couple of failed keys on the number pad has just occurred. Last year I swapped one of the hard drives for an SSD and it increased the speed significantly, as has windows 10. I'm thinking of replacing my wacom for this badboy.